Let's talk about all the delicious things on this plate. Pillowy gnocchi. Caramelized cremini mushrooms. Rich balsamic. A touch of Earth Balance. Fresh arugula. Crunchy toasted walnuts. And a big squeeze of lemon. Whenever I'm at an Italian restaurant or just generally surrounded by pasta choices, nine times out of ten I will choose gnocchi because, when it's done right, it's really incredible. After passing by the gnocchi in the pasta section of Trader Joe's over and over again, I finally decided to experiment with it and couldn't be happier with the result. 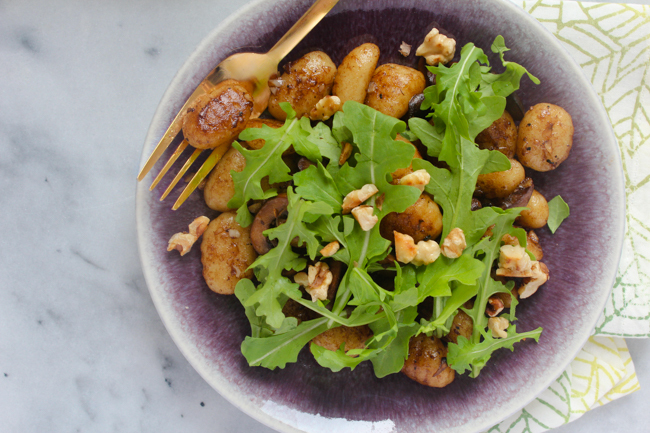 The first time I made this gnocchi was a Monday night when my boyfriend came over for dinner after work.The two of us ended up standing in the kitchen eating gnocchi after gnocchi out of the pan before serving what was actually left onto our plates, topping it with the arugula, walnuts and lemon and realizing it was even more incredible when complete. I've made this dish several times since then and it never fails. One of my favorite things about it is the amazing flavor you get from using just one tablespoon of Earth Balance. I wanted to avoid adding a bunch of butter to prevent it from getting too greasy and taking away from the natural decadence of the gnocchi. 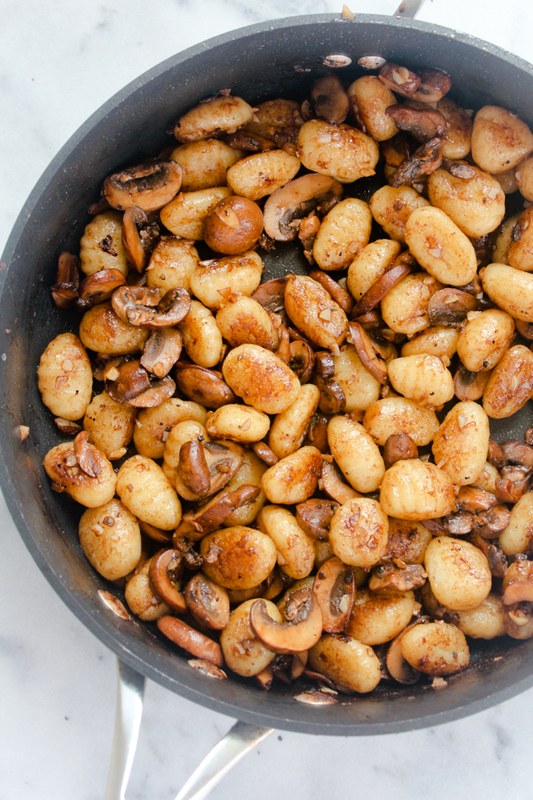 I'm so happy I tried it this way because one tablespoon is more than enough to allow the gnocchi to get toasty in the pan and still feel deliciously indulgent. Also, don't forgot to enter my giveaway to win some delicious plant-based treats! - Put a large pot of water to boil. Drizzle a small amount of olive oil in a large skillet and cook the mushrooms on medium high for about 5 minutes until liquid is released and cooked off and they start to brown. Do not over crowd the mushrooms in the skillet, if you need to do this in two parts to get all the mushrooms on one even layer no problem! Add 2 tablespoons balsamic vinegar to the mushrooms and cook another 5 minutes or so until golden brown. Remove from skillet and set aside. - Salt the boiling water and add gnocchi. Meanwhile, add the Earth Balance to the skillet adding the minced garlic when it has melted. 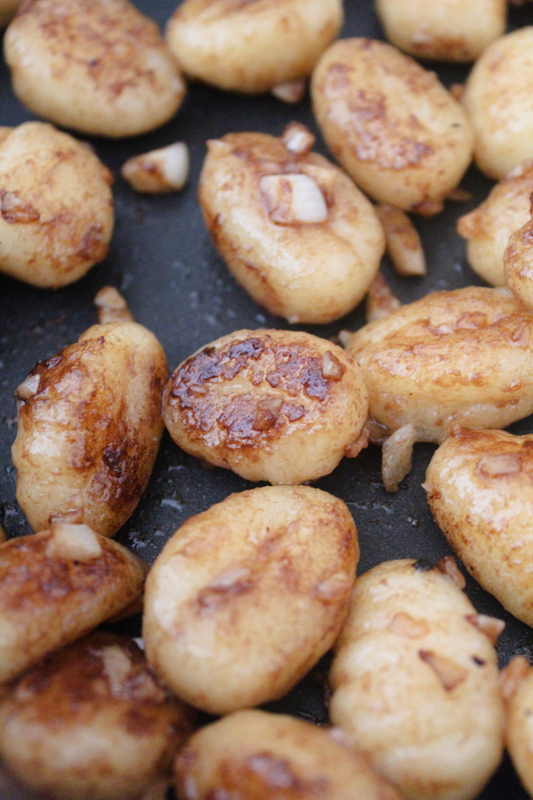 As the gnocchi floats to the top of the water, spoon it out and into the skillet. Once all the gnocchi are in the skillet, add the remaining tablespoon of balsamic vinegar and cook for about 5 minutes, stirring only occasionally so the gnocchi can brown on the sides. Stir in mushrooms. - To toast the walnuts, heat them in a skillet for one to two minutes over medium heat until they are golden brown and smell toasty. They can burn easily so stir often. Allow them to cool and then roughly chop. 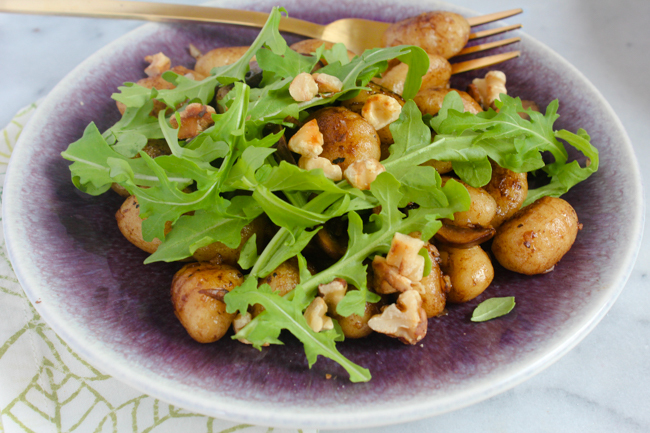 - Divide gnocchi on two plates and top each with a small handful of arugula, toasted walnuts and big squeeze of lemon. I just bought mushrooms from Costco. Now I know what I'm going to do with it. Haha. It looks sooo amazing and I bet the taste is as good! Yay! This is such a good use for all those mushrooms. Let me know what you think! Thanks so much! Just visited your blog and would love to follow each other! I forget how much I love the taste of mushroom until I see or cook them. Definitely saving this recipe. Thanks much! Mushrooms are one of my favorites too! And I love them here with balsamic. Thanks for stopping by! It is super delicious and easy! The best combo. Stop it now! Mushrooms are my favorite food and who doesn't love little pillows to eat! I've literally been calling them that since I was little, ha! I need to make a gluten free version of these! Yummm. Happy weekend, Julia! Ahh arent they just the best! 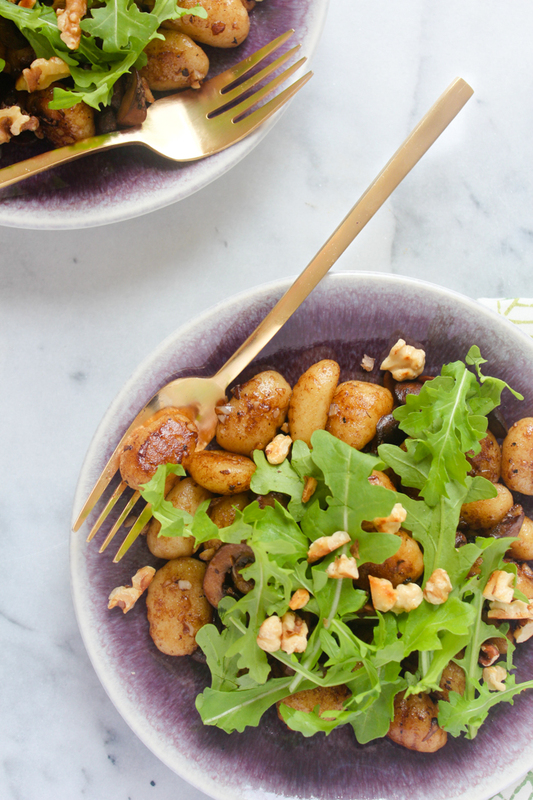 Mushrooms and gnocchi are two of my favorite things so this is definitely one of my favorite recipes! 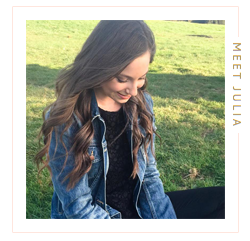 I made it, Julia! Tonight for din. Well, a version of it but pretty much the same thing! My hub wants me to make it once a week. Such a great recipe, girl! Thank you!! OMG!! This is torture. Don't know why I come on your blog during lunch time haha! This looks so tastyyyy! Hahah biggest compliment. Thank you! This looks amazing! 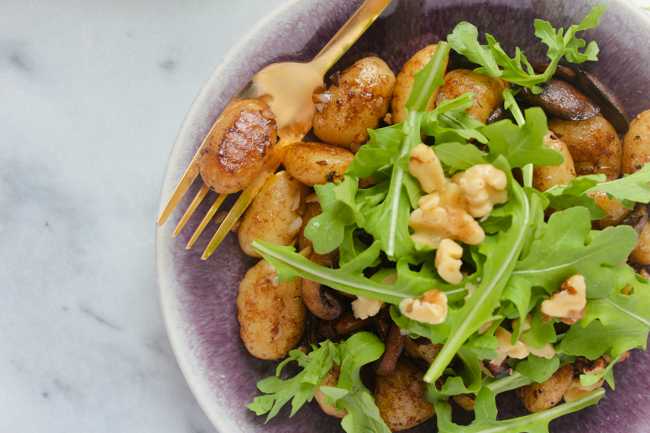 I love the idea of combining gnocchi with arugula - absolute genius! This looks yummy! Thanks for sharing the recipe! I need to stop coming here when its so close to midnight. im always getting hungry after looking at your pics and recipes. check out my blog. i nominated you for the liebster award. can't wait to read your post. Hahahaha definitely dangerous for late night snacking!! Thanks so much for nominating me! Can't wait to do my own post! Definitely! Let me know how you like it!